Recovery, it has been such an adventure to find my path towards it. I decided to try to take control of my mental health on March 16th, 2017. I have Bipolar 1 and ADHD. My journey towards recovery has been a very short one but very eventful. I started with an idea of recovery that has changed with time. My original goal was to be functioning and mentally stable. I didn't really know what functioning meant because I lived my whole life in a manic or depressed state. So it has been a learning process and lots of trying new things. 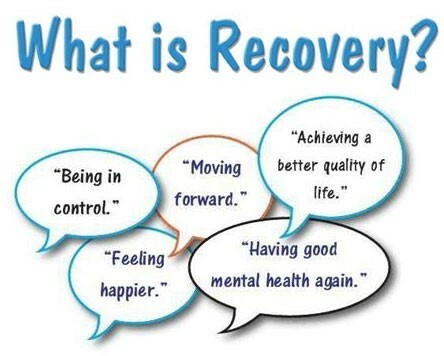 I do consider myself someone that is on the right path towards recovery. I will share how I am on this path. The first thing I do every morning no matter how late I wake up is take my medication. If that is all I can do for the day at least I did what I needed to do for my brain. Doing this when I'm not feeling my best makes me feel accomplished. The feeling I get after that is a good feeling and is usually enough motivation to go on with my day. Medication is the one thing that will remain constant in my life. I also go to therapy once per week. I make sure I get to therapy because therapy helps me sort things out that I may be struggling with. I keep a sleep routine that I try to stick to on a daily basis. I take my medications at 8 and I try to be in bed by 10. Getting a good amount of sleep is imperative to my mental health. I also try to go once per week to either the living room, drop in center or a support group. This helps me surround myself with others that may be going through the same things as me. I also ask for help when I need it. It's ok to not feel our best, and it's ok to have to take it easy when we're not feeling our best. There are days I make small goals and there are days I work on long term goals. It's been awesome to realize one's recovery can look different every day. Celebrate all of the accomplishments no matter how small they may seem. Keep moving forward, even if you're taking baby steps. It's still moving forward.